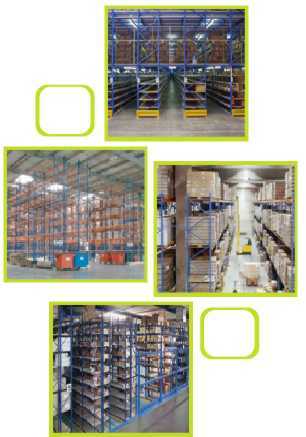 JJ Storage Systems offer warehouse pallet racking storage systems from smaller solutions, to the complete storage accessory range for a larger operational warehouse. From adjustable beam Pallet Racking, and heavy duty shelving through to 'live storage', & fully integrated turnkey warehouse schemes, our Pallet Racking sets a standard for goods, or product storage in small, medium, or large warehouses. A full range of basic components, and accessories to fulfill all of your warehouse storage requirements. Our system is designed for the optimised storage of products, and goods of all sizes and weights. All products have been thoroughly tested in specialised laboratories to determine their mechanical properties, & all meet the stringent requirements of the FEM code for Pallet Racking. Adjustable pallet racking, having frames and beams, is made to provide a modularised warehouse storage solution. The system is easily accessible with Fork Lift trucks using palleted loads. We also supply cantilever racking systems designed for the lightest loads, to the maximum storage capacities needed by your warehouse, which are the best storage solutions offered for warehousing needs. JJ Storage Systems can advise on warehouse planning, storage strategies optimal space management, & general warehouse storage solutions.